Happy 4th of July Weekend! Last year I decided to try and new recipe for our BBQ and it was so good that I think I am going to try and make it again this year. I wanted to share it with all of you incase you wanted to try something new! Basically for this recipe you boil some carrots and then soak them in a marinade overnight to give them that “hot dog” flavor. Then you cook them up and put them in a bun, lettuce wrap or all by itself…however you eat your hot dogs. I put mine in a regular hot dog but and topped it with ketchup, mustard and a little relish. You can also use a sprouted, low carb or many of the other hot dog bun options out there. A good place that has low carb bread options is The Great Low Carb Bread Company . 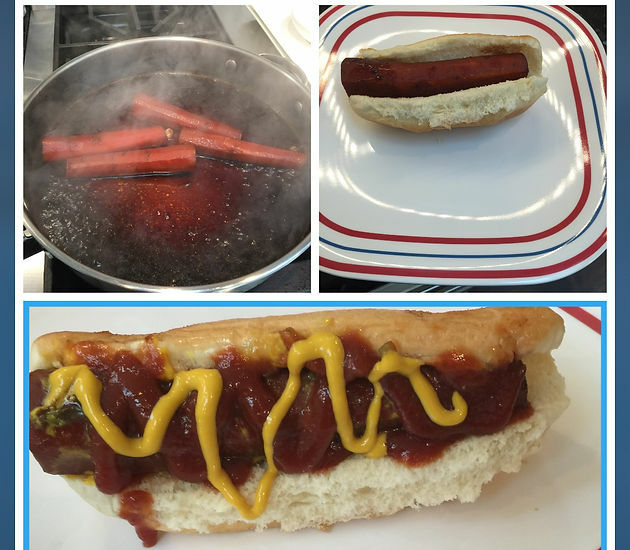 I wouldn’t say that this tastes exactly like hot dog but I made these before and I will continue to keep making them so that has to mean something right. If you are daring enough and willing to keep an open mind, I highly recommend that you giving this recipe a try! 1. Boil carrots for approximately 6-8 minutes, or until fork tender but not mushy. After removing the carrots from the boiling water run them under cold water to stop the cooking process. 2. While the carrots are cooking, whisk together the barges, water, vinegars, sesame oil, liquid smoke, garlic and seasonings. 3. Combine the carrots and the marinade in a gallon size zipper bag (use two incase of a leak) or in an airtight container. Shake gently to make sure carrots are coated with the marinade. Place the carrots in the refrigerator for at least 24 hours. 4. To cook the carrots, spray a medium skillet with olive oil cooking spray. Turn the heat to medium and place the carrots and a bout 1/2 cup of the marinade in to the skillet. Heat the carrots for approximately 8 – 10 minutes, or until warm. 5. Add carrot to bun or lettuce wrap and top with you desired “hot dog” toppings.